Delta 7/16 series connectors are large, versatile 50-ohm impedance connectors with M29 x 1.5 metric threaded coupling. These rugged connectors conform to DIN 47223, and feature good power-handling capability along with VSWR as low as 1.07:1 @ 2 GHz. 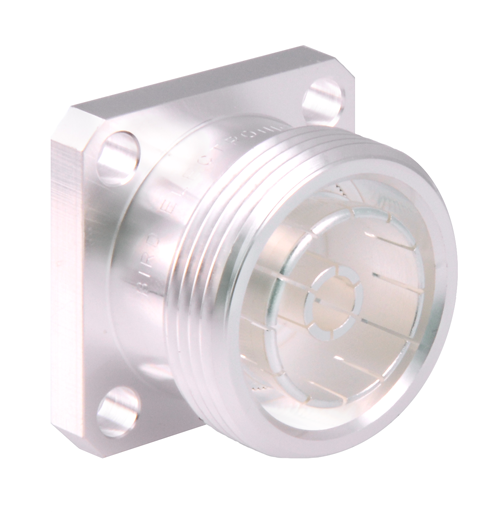 Because these connectors are designed to minimize signal distortion from intermodulation, silver plating is standard. The optional Albaloyplating provides greatly increased tarnish resistance while preserving the connectors' low intermodulation characteristics; optional nickel plating should only be specified when low intermodulation is not a concern in your system design. VersaCom cable connectors let you stock various body and cable attachment subassemblies, and assemble them into straight or right angle connectors as needed. 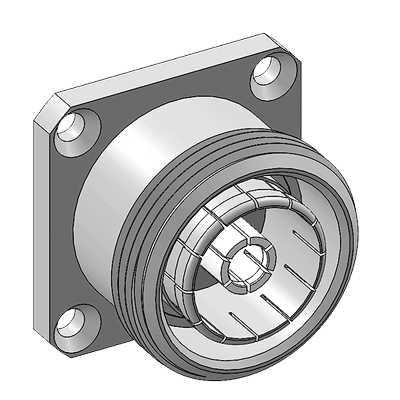 PressMount receptacles mount securely in a single round hole, saving space on your components and reducing your housing fabrication costs. Panel receptacles with common flange sizes to match the same hole pattern as standard type N connectors, letting you drill one hole pattern and mount BNC, N, SMA, TNC, or 7/16 series connectors as needed. All Delta 7/16 series plugs feature a coupling nut with a knurled surface for secure grip when hand-tightening, and a hex for tightening with a wrench. All can be supplied with full-length hex coupling nuts as well.